The huge athlete cradled the 16pound ball in his right hand poised just behind his right ear. He whirled in the power pirouette that provides a touch of grace to the brute sport, planted his right foot and took short, powerful steps forward and then lunged ahead, catapulting the steel ball up and away. There were oohs and aahs and the measurement confirmed what most had thought - amateur hurler Terry Albritton had set a world record of 71 feet, five inches in the shot, fully two feet further than he had ever hurled the shot before. If there were amazement and joy within the U.S. Olympic team (Albritton is competing in Montreal for U.S.), a former Israeli Olympian received the news in his office in the quiet college community of Amherst, Massachusetts without surprise. "How can you be surprised," asked Gideon Ariel, "when you knew he could do it? The computer showed it was possible." Indeed, Terry Albritton's recordbreaking throw, the effort to improve Doug Bird as a pitcher for the Kansas City Royals, and the development of new athletic equipment - shoes, tennis balls, tennis rackets - and a new exercise machine, were designed by Gideon and his computer. In fact, should the U.S. Olympic field events group establish all kinds of records at the July games and in other competition, officials might possibly cast a special gold medal for Gideon Ariel and his Computerized Biomechanical Analysis Inc. (CBA). 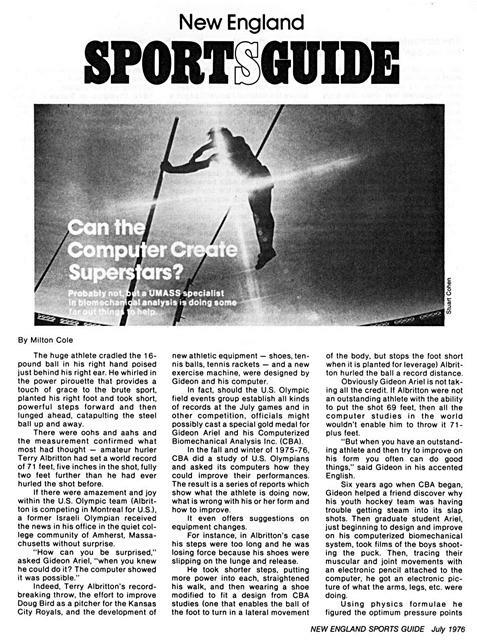 In the fall and winter of 1975-76, CBA did a study of U.S. Olympians and asked its computers how they could improve their performances. The result is a series of reports which show what the athlete is doing now, what is wrong with his or her form and how to improve. It even offers suggestions on equipment changes. For instance, in Albritton's case his steps were too long and he was losing force because his shoes were slipping on the lunge and, release. He took shorter steps, putting more power into each, straightened his walk, and then wearing a shoe modified to fit a design from CBA studies (one that enables the ball of the foot to turn in a lateral movement of the body, but stops the foot short when it is planted for leverage) Albritton hurled the ball a record distance. Obviously Gideon Ariel is not taking all the credit. If Albritton were not an outstanding athlete with the ability to put the shot 69 feet, then all the computer studies in the world wouldn't enable him to throw it 71plus feet. "But when you have an outstanding athlete and then try to improve on his form you often can do good things," said Gideon in his accented English. Six years ago when CBA began, Gideon helped a friend discover why his youth hockey team was having trouble getting steam into its slap shots. Then graduate student Ariel, just beginning to design and improve on his computerized biomechanical system, took films of the boys shooting the puck. Then, tracing their muscular and joint movements with an electronic pencil attached to the computer, he got an electronic picture of what the arms, legs, etc. were doing. The computer has its limits. You can chart what muscle and bone will do, but you can't chart what the brain will do. on the ice for the stick and where the most power would be generated. He presented his findings to his friend and suggested that when the boys were preparing to take their shot, they put a little more pressure on the stick to give the shot more force. The advice worked and Computerized Biomechanical Analysis was off and running. At the time Gideon was a graduate student and assistant track coach at UMass. The University of Wyoming graduate was able to film UMass and other athletes, chart their arm and leg action and help improve performance even as he was working to improve his system of plotting athletic endeavor. At about this time, 1972, Gideon's work came to the attention of Dartmouth College's track coach, Eric Wienbell, and the pair formed CBA. But theirs was still a relatively unknown firm and the science that was evolving had not exactly swept the sports world. Still there were some who heard and sought help. CBA filmed members of the Kansas City Chiefs professional football team and offered some advice on how some of the linemen in particular could improve performance. No one knows just how much it helped because Kansas City, getting older, fell on some hard times. Gideon insists that his system can only offer the ways to help improve. "After that it is up to the athlete to implement the advice," said Gideon. "For instance, we can chart athletes and determine what is possible from a muscle-and-bone standpoint. But you can't chart what the brain will do. "We could check films of Joe Louis and Rocky Marciano and Muhammad Ali and tell what they are capable of from a point of view of their arms, legs, muscles, etc. But there is no way of knowing what a fighter will do if the other fighter drops his hand, or how quickly he is going to decide to throw the left hook or right cross. "That's why those computer contests that show what would happen if one fighter met another, or one runner met another, or if Red Grange ran against O.J. Simpson, can't really tell an accurate story. The mind, the brain, the decision-making, when to cut back, when to follow the interference, etc. are not measurable." Gideon and CBA have done readouts on what might appear to be optimum performances. For instance, before the National Football League's National Conference championship game last winter, CBS asked Gideon and CBA to figure out how the respective placekickers, Tom Dempsey of Los Angeles and Tony Fritsch of Dallas, would do. The computer examined the joint and muscle movement of both, plotted trajectories and decided that Dempsey had the edge because his deformed foot with the square-toed shoe provided more impact force on the ball than did Fritsch. But the computer could not decide how either would act under heavy pressure situations. As it turned out, the whole study was of little value. Neither kicker played a major role as Dallas creamed the Rams. What the computer has found is the upper limit that the actual structure of bone and muscle can take and the figures: an 8-foot-4-inch high jump probably never will be attained because no one will ever be able to hit every facet of the optimum performance. Such studies provide Gideon and his firm with vital information to be used in other aspects of sports programs and improvement of performances and equipment. For instance, CBA has been doing research on shoes. One study was done for the federal government to determine if shoes that we wear normally are improperly designed and if so how they can be improved. The study which has been filed with the U.S. Department of Commerce indicates that shoes as currently made and designed are a prime cause of lower back problems. This study was merged later with one done for Uniroyal on a better shoe for miler Jim Ryun to use when running. The government hasn't yet mandated a change in shoe design but Uniroyal has made a shoe for Ryun (since retired) to be used by other runners. Its heel consists of energy-absorbing, rubber-like material that then helps push the energy back. The heel is designed to flow into the sole in a kind of rolling motion so the energy is constant. The shoe is meeting with success and being emulated by other manufacturers. 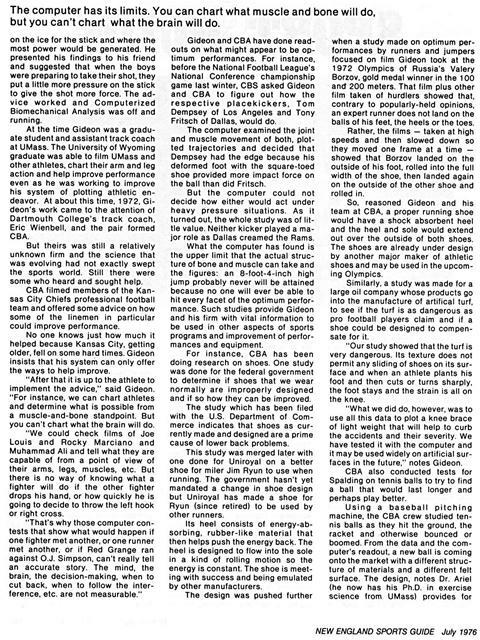 when a study made on optimum performances by runners and jumpers focused on film Gideon took at the 1972 Olympics of Russia's Valery Borzov, gold medal winner in the 100 and 200 meters. That film plus other film taken of hurdlers showed that, contrary to popularly-held opinions, an expert runner does not land on the balls of his feet, the heels or the toes. Rather, the films - taken at high speeds and then slowed down so they moved one frame at a time - showed that Borzov landed on the outside of his foot, rolled into the full width of the shoe, then landed again on the outside of the other shoe and rolled in. So, reasoned Gideon and his team at CBA, a proper running shoe would have a shock absorbent heel and the heel and sole would extend out over the outside of both shoes. The shoes are already under design by another major maker of athletic shoes and may be used in the upcoming Olympics. Similarly, a study was made for a large oil company whose products go into the manufacture of artifical turf, to see if the turf is as dangerous as pro football players claim and if a shoe could be designed to compensate for it. "Our study showed that the turf is very dangerous. Its texture does not permit any sliding of shoes on its surface and when an athlete plants his foot and then cuts or turns sharply, the foot stays and the strain is all on the knee. "What we did do, however, was to use all this data to plot a knee brace of light weight that will help to curb the accidents and their severity. We have tested it with the computer and it may be used widely on artificial surfaces in the future," notes Gideon. CBA also conducted tests for Spalding on tennis balls to try to find a ball that would last longer and perhaps play better. If the U.S. field events group sets any records in July's Summer Olympics, officials should cast a special gold medal for Gideon Ariel. more of the ball to be on the racket longer. It is only a millisecond longer. but it seems to provide the player with greater control of the ball, greater ability to return the shot or service. "Those who have used the new ball in experiments are pleased with its performance and with their game without knowing why," said Gideon. And while studying the action of the tennis ball, the CBA people viewed film of the human arm returning tennis shots and figured that the arm was asked to make more turning motions in returning the ball than it was equipped to do. "That's where tennis elbow came from," said Ariel who doesn't play too much tennis himself. How then to get the racket turned so the face hits the ball properly without making the arm go through unnatural stresses? The answer, CBA feels, may be an experimental racket it designed. It has a handle that turns. (The grip is on a shaft that lets the grip turn.) The tension is adjustable so that the amount of turn is controlled, permitting the full face of the racket to meet the ball. The computer, with the electronic pencil tracing how the sporting equipment or sportsman performs, can offer insight into what is being done wrong and how to do it right. But often doing it right is another matter, a matter of human frailty and inability to adjust. If all could follow the plan designed by the computer and its experts. we'd all be superstars! 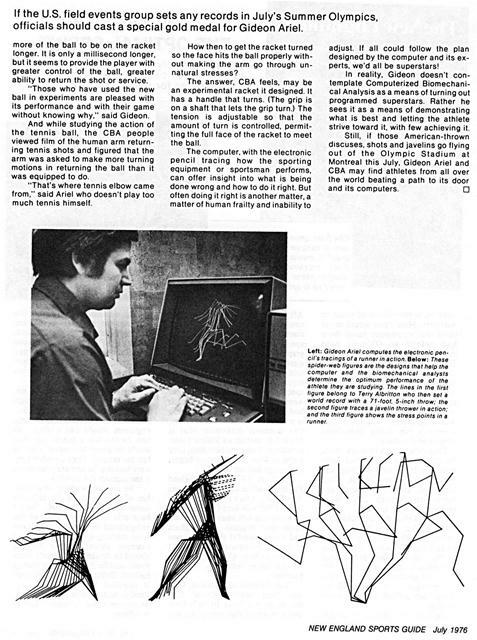 In reality, Gideon doesn't contemplate Computerized Biomechanical Analysis as a means of turning out programmed superstars. Rather he sees it as a means of demonstrating what is best and letting the athlete strive toward it, with few achieving it. Generated on 4/22/2019 5:06:36 PM (PST) ADI/HQ/GBA/2019/ARIELCLOUD/v3.0.2018.0126.